Have you ever been frustrated because all you want to do is sit down and relax? Maybe watch your favorite show or work on your favorite hobby? But, the dishes need to be done and the table needs to be cleared off from dinner. Perhaps the floor needs to be swept and the trash is overflowing. And then it frustrates you even more because your husband and kids are relaxing by reading their favorite book, watching TV or playing a game. So you go into the kitchen and loudly close a cabinet door... perhaps bang a couple of pots around... huff and sigh a little (or a lot), but they don't seem to be bothered by the noise and they're not running to the kitchen to help. The only thing happening is your getting more and more irritated. Has this only happened to me? Sometimes... we just need a little help. Just a person to say, "Hey, do you need help with anything?" When it gets to the point of me being this frustrated, I'm pretty sure it makes my husband want to run away and avoid me until I calm down instead of help. I have realized that my husband can't read my mind and may not know what to do to help me. If we don't tell our husbands how we feel... how will they know what we need? Once your husband has had some time to get settled in at home after a long day of work, possibly even after dinner, try to have an open conversation with him about how you get overwhelmed with all the things on your daily to-do list. I would definitely not start it off with something like, "You know... it really aggravates me that you don't help out much around here. I do this and I do that every.single.day. Could you at least take the trash out for me?" This will cause your sweet husband to instantly shut down and turn on his selective hearing. 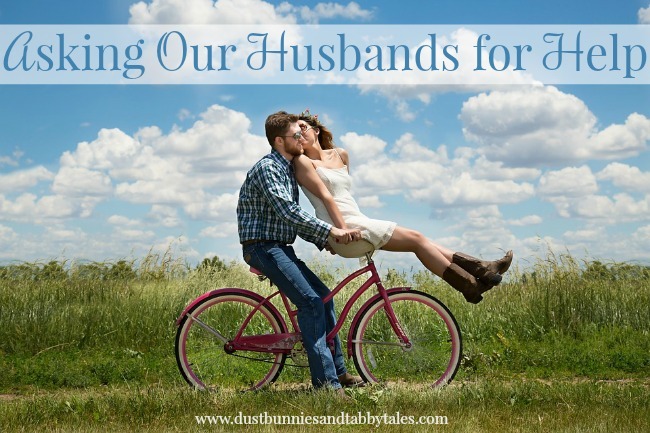 The worst thing we can do is guilt our husbands into helping. You could start the conversation by saying, "Honey, I really have had a frustrating day. I'm getting a bit overwhelmed with all of the things that need to be done and I would really like to have some time to relax tonight. Do you think you could help me with a couple of things real quick?" When your sweet hubby does help, please don't criticize what he helped with because he didn't do it the way you thought it should be done. Thank him! Tell him how much you appreciate his help and he will be willing to help more often. 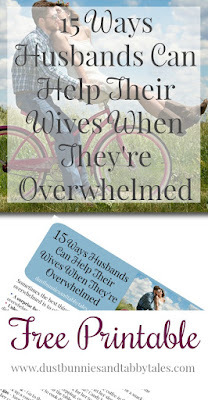 I came up with a list of 15 Ways Husbands Can Help Their Wives When They Are Overwhelmed and it's completely free for you to print out and share with him. When you are having a conversation with your husband you could ask him if he would mind looking over this list of ideas that you found online. Or you could say, "If you ever see me getting overwhelmed and you would like to help, but are unsure of what you can do... here are a few suggestions." I was talking to my husband Friday morning about this list and how I wanted to create it to help wives and husbands. I explained to him that sometimes all we would like is help or even the offer of help from our husbands and most of the time our poor husbands don't even know what we need help with. And as we are ending the conversation, my husband says... quietly... "Do I need to pull anything off of that list?" He's always making me laugh. such an important topic! Too often we wait to ask for help until we are going off the deep end! Absolutely! Communication is so important in marriages. Thanks for visiting!